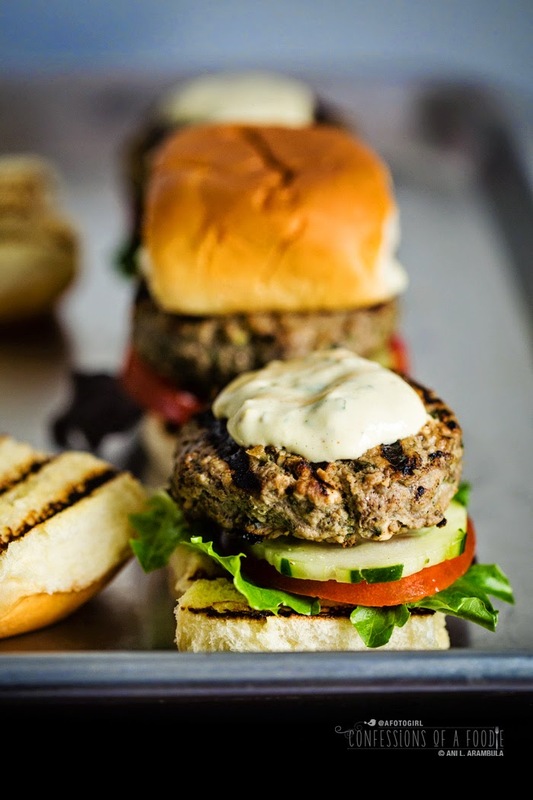 American burgers go global and mini in this slider recipe that combines grass fed beef with Greek feta and Moroccan harissa sauce paired with Hawaiian sweet rolls. 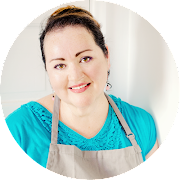 When it comes to creating recipes, I rather enjoy mixing up cultures, borrowing spices from one and adding them to ingredients associated with another just to see what happens. My first thought was that it's like a "melting pot" style recipe but then considering this is a food blog, it occurred to me that this phrase conjured up the idea of an actual pot melting. Not the best imagery for a food blog. Anyway, on to this recipe I'm sharing today. Earlier this year when we were in a bit of a heatwave, auntie and I decided to fire up the grill for the first time in 2015. I starting digging through the fridge to see what I had and this recipe was born as a full-size hamburger. 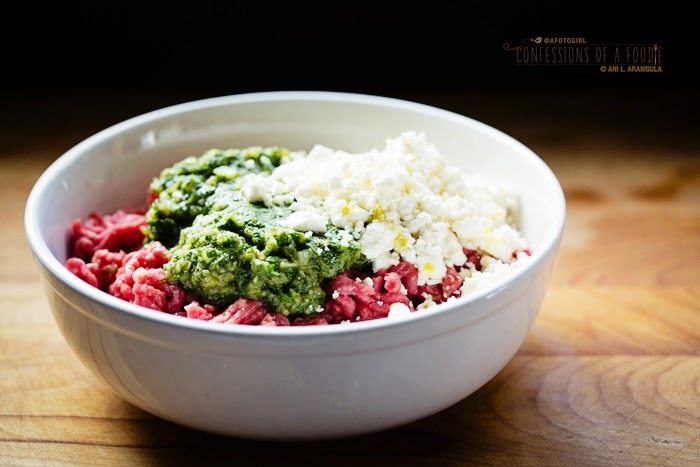 Lean ground grass fed beef, the basis of many good American burgers, met up with Greek Feta and Moroccan harissa (this time around, it was Mina Harissa Spicy Green Pepper Sauce). I made it a few more times before deciding to make them into sliders and contrast the spiciness with Hawaiian sweet rolls. With that last tweak, I decided these babies were ready to share. As noted in cookie and meatball recipes I've shared, I have a thing about uniformity when it comes to recipes that call for making multiples of things. 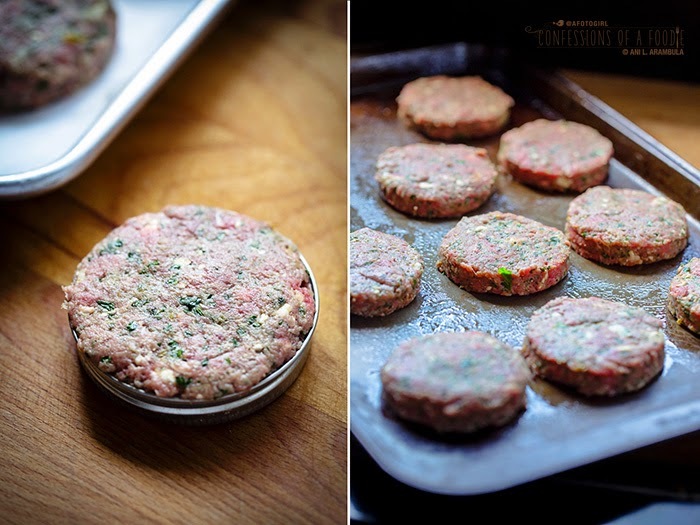 So when I came across this trick on Pinterest to make uniform patties, I was like, "Holy cow! Why didn't I think of that!" She used random jar lids lined with plastic wrap to form perfect patties. I immediately went straight to my mason jar obsession and knew that my jelly jar lids were the perfect slider size. 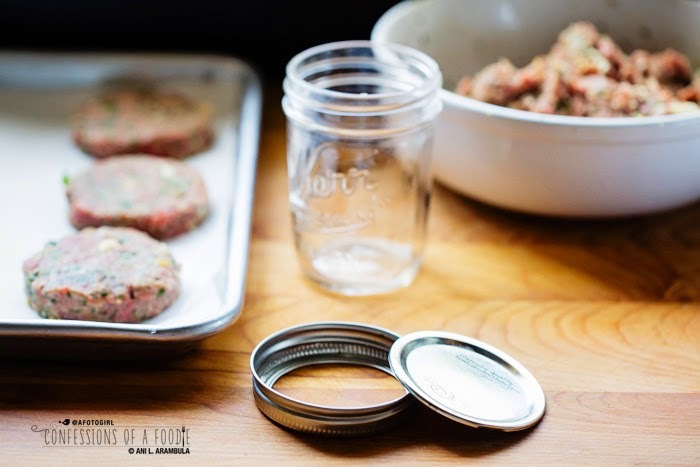 The fact that canning lids have two parts means that making perfectly formed slider patties will be super quick and easy. Just stuff the meat into the lid applying pressure with the palm of your hand so that the edge of the lid helps to cut away the excess meat, then swipe your finger around the circumference, wiping away the excess meat hanging over the lip of the lid, flip the lid over and push the removable flat part out of the ring, then carefully peel it off and ta-da! Perfectly formed patty. 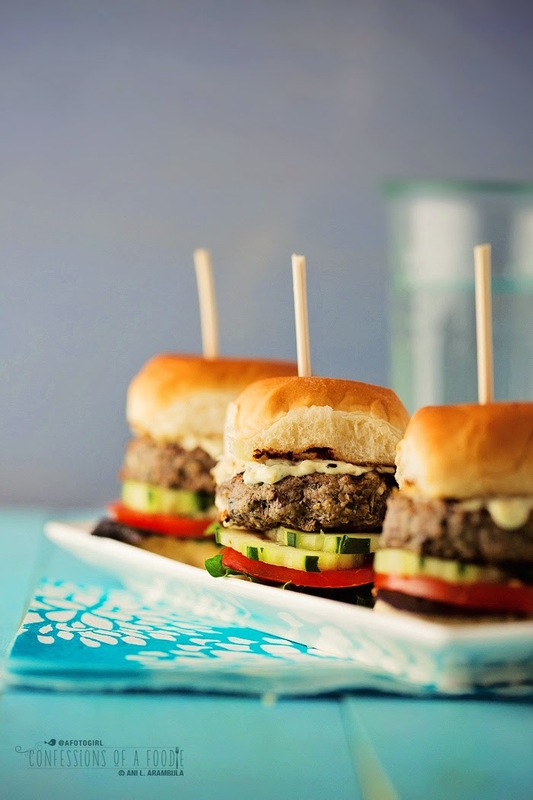 I made 10 slider patties in no time flat! The rolls are a total splurge for me as they are much higher in carbs than my normal meals. Not to mention that I try hard to refrain from white flour and white sugar. So as presented here, this recipe is definitely a once-in-a-while treat so perfect for a party or special occasion. 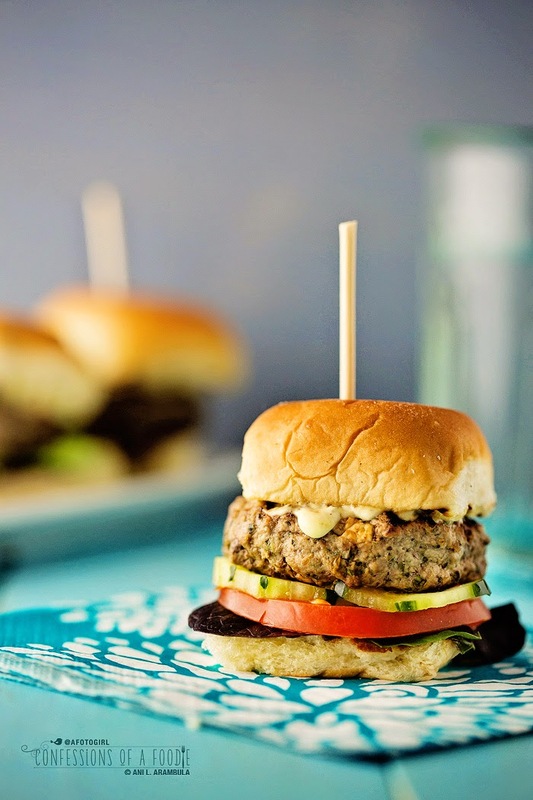 However, it's a cinch to make these burgers paleo by wrapping them up in lettuce or using thick slices of grilled sweet potato as the "bun" component (the potato bun idea I saw on Pinterest and I can't wait to try it!). So here we are. Just in time for Memorial Day – the official start of the grilling season. Make these because who doesn't like mini food? This is the second in eight recipes I'm developing using Mina Harissa. This time, I'm using the spicy green pepper sauce. 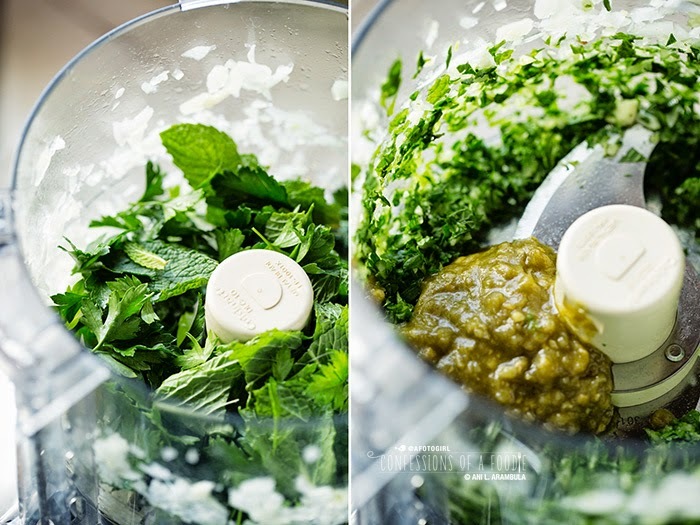 It adds a tanginess that reminds me of raw tomatillo salsa. 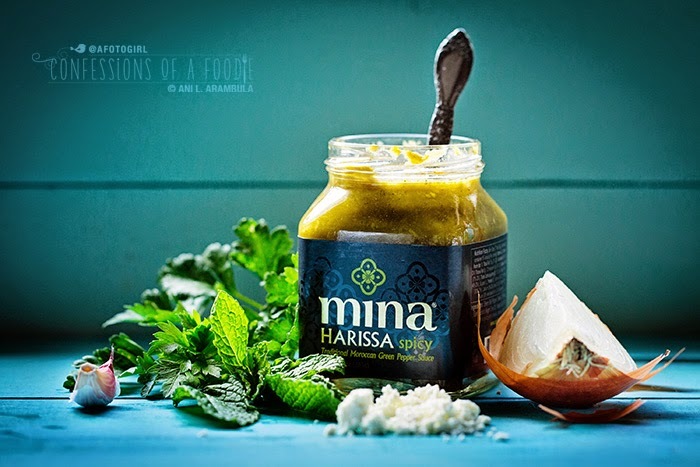 Mina Harissa is available at Whole Foods and Bristol Farms. Also, you can certainly make these into regular-sized burgers if you don't want to go the sweet roll route. If you're going for uniformly sized patties like I have here, you'll also need a jar lid slightly larger than your bun. I used a canning lid from my 8 ounce Mason jar. Place meat into a mixing bowl using your fingers to break up. Pulse onion and garlic together in a food processor until just chopped. 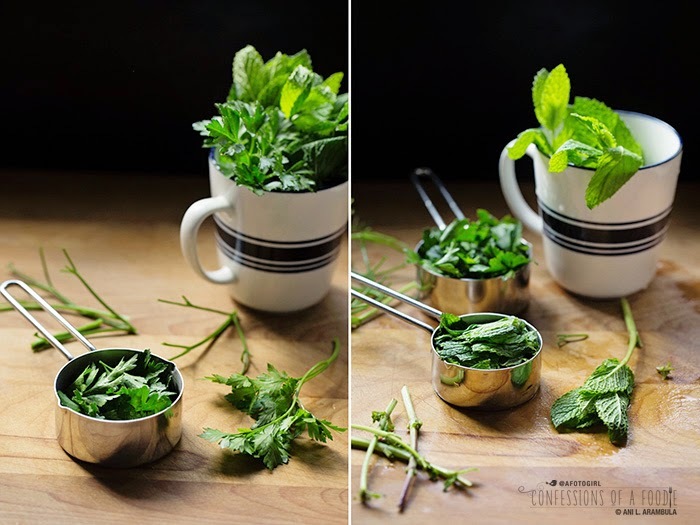 Toss in parsley and mint; pulse to chop. Add harissa, salt and pepper; pulse until combined. Using a rubber spatula, scrap harissa mixture into meat bowl. Add the cheese and olive oil then use hands to combine well, careful not to overwork the meat. Press meat into the canning lid of an 8 ounce jar. Clean edges then pop meat out and set on a rimmed baking sheet. Repeat for remaining meat, ending up with 10 patties. Heat a grill or grill pan to medium high. 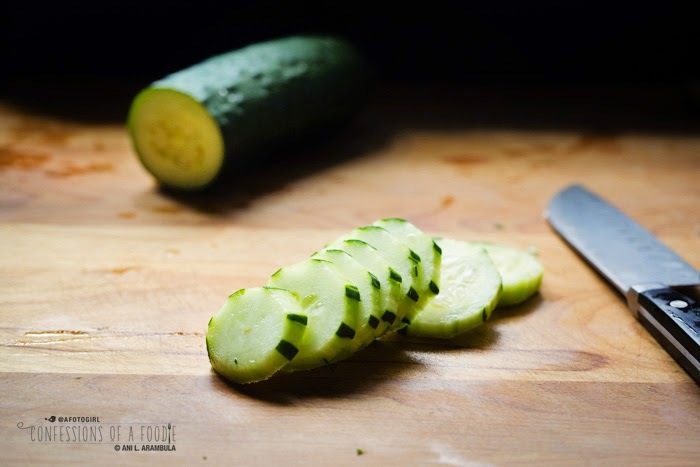 While the pan or grill is warming, prepare cucumber and tomato slices and make the spicy mayonnaise by combining the mayonnaise with 2-3 tablespoons of harissa, mustard and chopped mint in a small bowl; refrigerate until ready to assemble. 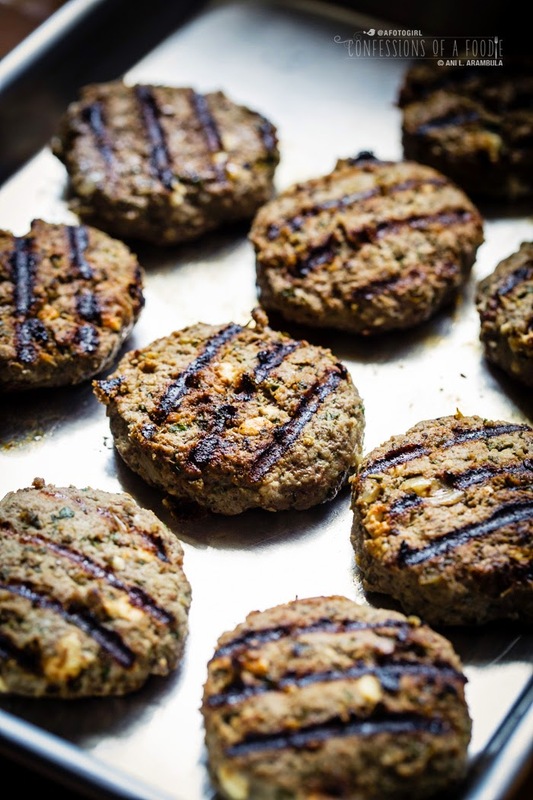 When grill is hot, brush olive oil on grates using paper towels and grill tongs (or brush grill pan if using) then grill patties for 4 minutes on first side and 2 minutes on second side or until desired doneness. Toast sliced buns, cut-side down on grill until desired grill marks appear; remove buns. 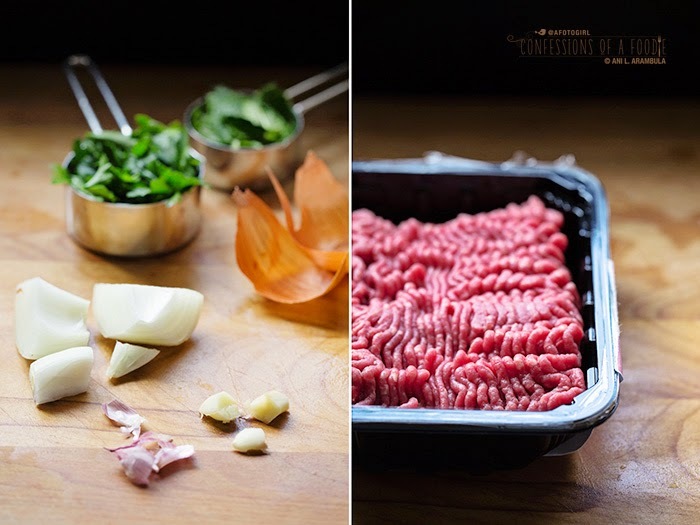 To assembly sliders, place 2 leaves of baby greens on a bottom bun. Add a slice of tomato, 2 slices of cucumber then the patty. Place a dollop of mayonnaise on the patty then cover with top bun and serve. Disclosure: Cassablanca Foods, the maker of Mina Harissa, is providing some compensation for recipe development. This is the second of eight recipes that I'll be sharing through the end of summer. To help offset the cost of running this blog I sometimes take on sponsored posts but rest assured, I only work with brands I love and use myself and feel 100% confident in sharing these brands with you. As always, all opinions, photographs and recipes are wholly my own.